We flew on Tuesday and arrived there in Italy on Wednesday. The weather in Italy had already turned a little bit cold and windy. It was raining when we arrived there but then the weather cleared up and got quite nice for Thursday and part of the day Friday. Saturday it was cool again and a bit windy, then the weather turned really bad on Saturday night with lots and lots of heavy wind and lots of rain almost the entire day on Sunday. Our first Supermoto practice Sunday morning was actually dry, I think that was about 10:15am, but I think that was the last thing that was done in the dry. Besides that I think the motorshow was great. It looked like there was a lot of good participation from the different manufacturers and quite a few aftermarket companies. Yamaha had a big presence, unfortunately Suzuki Italy had their Dealer Show that weekend so they had no one there, no representatives, but I am sure once they hear how good the show was and what a success it was as far as spectators, I am sure they will be involved in it next year and years to come. From a racing standpoint, Jean Christophe Wagner sent me an RMZ/DRZ400/450 part 250. A motorcycle that is basically a new RMZ250 chassis with the DRZ400 made into a 450 supermoto bike that he has built specifically for Stefan Chambon and Stefan normally rides it once or twice a year and wins all the biggest Supermotard races in France like Bercey and if he chooses to do any other ones he normally wins there as well. Thank you very much to Jean Christophe for sending Richard and Leonard who worked on the bike. We didn’t make a lot of changes to the motorcycle, I think the motorcycle was basically good, it’s just the loose screw on top of it trying to figure out exactly how to ride the thing and see how fast he could go and what the limits were. 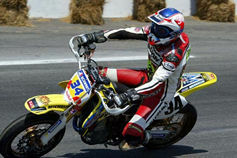 The Supermoto bike was great. I was a little bit uncertain as to how everything was happening and didn’t realize the first practice was going to be for our starting positions. I was just out there trying to do a fast lap and see what my times were like compared to everybody else. With no transponder for a time they put me 11th on the grid. The first race I finished 7th, I had three crashes in front of me that I had to stop for and the second race I was 6th. Both those races were in the dry. On Sunday it was dry for practice, the bike was still good but we were pretty certain the rain was coming and was going to be wet for the race. Valentino had a bit of a sleep-in and missed the only practice on Sunday morning so he decided to go out about lunchtime and ride around in the rain to see how slick the track was and decide whether he wanted to race or not. A few of us decided that when Valentino was out there we should go out and practice as well. I got the bright idea while I was out there to try and stop the guys on the track and organize a race. I felt like there were spectators there, they wanted to see racing so lets give them a race. The main draw there was Valentino Rossi and he was out so why did we want to have to go in and get out of our wet leathers only to get back in our wet leathers and do this again. Lets go ahead and get one race done and if one was all we did then great. We managed to get it organized, we all did a race, all of us, six of us I think it was all made it on one row. One guys’ bike didn’t start and Valentino passed someone for the lead and he then fell down. Casey Stoner tried to pass the guy for the lead and he fell. I was running second behind some local Italian guy on a Honda and finally got around him and managed to win the race, I think it was either 10-15 laps long. Besides that we got to drive some rally cars, I drove a Mistubishi Evo7. A lot of the other guys drove Subaru’s but Colin McRae, the Italian National Champion and his navigator were there, but they were both driving. They had some pretty serious rally competition there in the form of rally car drivers as well as myself, Graziano Rossi, Valentino Rossi, Loris Capirossi, and Marco Melandri. We organized some races on Saturday in the dry and some races on Sunday in the wet. All in all it was a really fun weekend. The highlight to my weekend besides winning the Supermoto race was outrunning Colin McRae twice in two separate races on Sunday. I am not sure exactly how hard he was trying but we hung out a little bit afterwards and had some dinner and he claimed to have been driving as hard as he could. Thanks Colin if you weren’t and if you were, I guess factory Mitsubishi or Subaru can contact me through the school at schwantzschool.com if they need to send me an e-mail and see what my schedule is like for next year! I think the motor show in Pesaro was a great success from, like I mentioned earlier, the numbers I heard of people that were there it seems like it will be something that will happen over the next few years anyway. It was great to see the likes of Ago, John Surtees, Kent Andersson, Phil Read and all kinds of guys there riding, playing, having fun, having bikes on display, having cars on display. The Italians are so passionate about their motorsport. To me it is unbelievable to see how well Valentino Rossi at twenty-something years of age can manage to keep his cool as well as he has with all the fans that line up outside his trailer who scream every time they see his face. I don’t remember ever having that kind of fan base and think it just shows you just exactly how serious the Italian public are about their motorsports whether it is Formula 1, MotoGP, World Superbikes or just any type of motorsports they are absolutely crazy about it, almost as much as they are football. Congratulations to Valentino on his World Championship this year. I think he and Yamaha did a great job. I am glad to see some other manufacturer win the World Championship. I think it is great for the sport. ??????? ????? ????????? ""?????? ???? ????? ????? ?, ????????? ???? ?, ?? ??????? ???-??? ??????????? ???? ?, ??????? ??? ?, ?????? ?, ""???? ??? ?????? ?, ?????????? ? ?????? ??????????? ??????. ???? ""? ??? ????? ???????? ???????.
? ???? ?? ""??? ???????? ????? ??????? ?? ""???? ?? ?????? ???????? ???. ??? ? ????????? ?????? ?, ?? ??????????? ????? ?????? ?? ????? ?????? ; ""?? ?????? ????? ?, ???? ?????? ""?? ??? ?, ??????? ????? ????? ?, ???? ? ??? ? ???? "?????????? ?????? ??????? ?? ?????????"???? ????????.
? ??? ???????????? ?, ??????? ???? ""? ???????? ??????? ?, ????? ?, ??? ?????? ???? ?????? ???????? ???????? ????. ?????? ??????? ?, ?????? ?, ?????? ""???? ? ??? ????? ??????, ? ????? ? ??????? ?, ?? ???????? ???????. ?????? ????? ????? ???????? ?? ??????????.
? ?, ?????? ???????????? ??? ???????? ??????????? ????? ""? ?????? ???????.
? ?????? ???? ? ????? ? ?????? ? ??? ???? ???? ?, ??? ?? ?? ????? ?????? ?? ???????. ?????? ?? ????????????? ?????? ???????? ?, ???????? ??? ????? ""?????????, ? ????? ?, ??? ?????????? ""????????? ??? ?????????? ?, ??????? ????? ? ??????? ????????????? ??????? ?????????. ???? ?? ?????? ??????? ?????? ""? ??????? ?, ???????? ???????. ????? ??? ?, ??? ""?? ???????? ????? ?, ???? ?? ????????????????? ????? ????????? ??????????. ??????? ""???? ?????? ?? ???? ? ?????? ???????. ??? ????? ???? ????????? ??? ?, ?? ??? ""???? ?, ??? ? ????? ?, ?? ???????????? ??????????? ???? ???????? ?, ????? ??????????? ?, ?????? ??? ??? ?????????? ????????? ???????????? ?????????. ???? ?? ????? ?????? ??????, ? ? ? ??????? ???? ??? ?, ???? ??????? ??? ????????.
? ????? ???? ??? ??????????? ???????? ??????? ? ???????. ?? ???????????? ??? ?? ?????????? ??? ?????????, ? ?? ????? ????? ????. ???? ?????? ? ???? ?, ??????? ????.
? ??????? ????? ??? ??????? ??????????????? ???? ???. ???? "??????? ????"?? ?????? ??? ???????? ?, ???????? "????? ??????????????? ?, ??? ? ??? ?? ???? ????????"? ?, ???? ??????????? ????? ??????????,-?? ? "???? ?????? ? ????????? ???????? ? ??????? ?????"?????? ??? ??????! ??? ????? ????????????? ???????? ?, ??? ?, "??????? ???????"???????? ?, ?????? ????????? ? ????????, ? ???????? ? ?? ?????????? ? ??????????.
? ??? ?? ?? ? ?????? ??????? ? ??????? ??????. ??? ????? ??????????? ?? ????? ????. ??? ?????? ????? ?, ??? ??????? ??????. ?? ????? "????????? ??????? ????????? ?????"?? ?, ?? ?? ?????? ?????! ?????? ??? ??????? ? ???? ??????. ?? ?? ???? ???????? ?, ??? ????? ??? ???? ??????????? ? "?????????? ??????? ?? ??????? ???????"????? ???????????? ??????????. ?? ????? ????????? ??????? ????????? ?? ???. ?????? ????? ???? ?????????? ? ????. ???? "???? ????? ?? ???????????? ??????"?? ?????? ??????? ???? ?, "????? ?? ??????????? ???????"?? ????? ?, ?? ?????? ????? ??????? ????????????? ????. ??-????????, ? ??????? ????? ??? ? ?, ?????? ??? ?? ?? ??????? ??????? ? ?? ????????? ?? ; ??????????????? "???????? ?? packard bell" ????? ??? ?, "??????? ???? ??? ???????" ??? ???????? ? ??????. ????? ??? ?????? ?, ??? ??? ?????, ? ?????????, ? ????? "Sumotori dreams crack" ??????? ? ???? ?, ??????? ??????????? ?????? ???????? ? ????????? ?????????? ?, ??? ?? ??????????? ??????? "??????? ????? ???????" ??????????.
? ?? ???? ???????? ?? ?, ????? ???????? ?????????? ?? ?, ??? ??? ?? ????? ``?????????''. ?????? ??????? ? ????? ?? ???????? ????? ??????????. ???? "???? ??????? ???????? ?????" ????? ????? ????? ????? ?, "??????? ????? ?????? ???????" ?????? ??????????? ??????, ? ??? ??????? ?????? ?????-?? ???? ?, ??????? ?????????? ?? ????? ?, ????? ??????? ???????? ?, ???????? ???????????. We went to Japan on Wednesday, October 20, which was the day after our last school of the 2004 season at Road Atlanta. All in all everything went pretty smooth. The flight was good, probably a bit longer than we all would have liked, but it was fine. We got there and the people from the Suzuki Domestic Department led by Mr. Yoshihide Miyamoto and Ms. Tomomi Ito were there to greet us and help us get all our bags to Hamamatsu-City where the Suzuki factory is as well as Ryuyo, the Suzuki test track where we were doing the school. We had two big bags each and getting through the Narita airport, down to the Narita Express train and into Tokyo station and then changing down trains there was quite an ordeal both going and coming back home but the people from Suzuki helped us a lot. Likewise they did a great job organizing the school. Between Marnie’s work and the Japanese wanting to be as good as they possibly could be, the school came off really well. Ryuyo is a little bit longer and probably not a real challenging track from a riding aspect but I think all the students had a really good time. We were really lucky with the Japanese weather, a typhoon had just come through and the weather was really nice for the two days we had the school. I actually wore shorts on both days which is not usual for that time of year. A little cool in the mornings but really nice, a little bit windy the second day, but all in all the schools went well. The KSSS program in Japan was accepted as good as it has been anywhere, whether it be Germany or France or even in the States. In addition to the school program, they had also organized a fan party-talk show on Sunday evening at the Grand Hotel for about 300 people that included the 30 students, about 70 press and then invited guests. Among the special invitees up on stage with me were Fujio Yoshimura and Mitsuo Ito, neither of whom I had seen in many years, we recalled old racing stories and laughed quite a bit. For me it was a lot of fun, I enjoyed getting to see the factory, getting to go see the Grand Prix workshop, talk to some of the guys that worked at the factory when I was racing. I didn’t think many of those guys were still alive but I guess I am not as old as I think I am! Once again Suzuki Japan by no means had they surprised me, but I think everybody else involved with KSSS was pleasantly surprised at how well they were organized for it and how professional they were in their presentation, we even had Halloween decorations for the school. It would be neat to be going back to Japan real soon, but it sounds like the Domestic Department being as small as it is and the Tokyo Motor Show happening next year we may only be going back to Japan every other year, but I guess that’s ok. It would be fun to do more schools over there, but getting the test track there at Suzuki isn’t the easiest think in the world to do either. Suzuki Japan organizing Satoshi Tsujimoto and Masaru Mizutani really helped the school. Both those guys are quite famous in their own right. Having them there benefited the school as well as the staff we took from the US, which was Lee (Acree), Ted (Cobb), and Brad (Coleman). A tip of the hat to Suzuki Motor Corp for a great job. ?????????? ?, ??????? ?, ""???????? ????? ????????????? ?????????. ?????? ""?? ?????? ??????? ???????????? ??? ??????? ""???? ?, ?, ????? ??? ?, ?????? ?, ??? "??????? ??????? ??????"??????? ??? ????????? ????????? ??? ?????? ??? ????????? ?, ??????? ""??????? ?????. ?????? ???????? ????? ?, ????? "??????? ????? ?????"???? ???????????????? ??????????? ???. ?? ?? "???? ????? ????? ???????"?????? ??? ????????? ?, ?? ?????? ???????? ????????? ???? ?, ?????? "?????????? ???????? ????? ???????"????-?? ?? ????, ? ""? ??? ??????????? ??????. ?????????? ""?????? ?? ????? ?? ????? ??????.
? ?, "??????? ?????? ???????? ?????????"??? ? ?????? ?? ?????? ??????? ?, ??? ???? ????????? ?????? ?, ?????? ?? ???? ??????? ?????.
? ?????? ?????? ????, ? ?, ????????????? ??????? ????????????? ?, "?????????? ???? ????????? ??????? 7"?????? ??????? ??????. ?? ?, ?????? ????, ? ???????? ??????? ??? ?? ?????????? ??????? ????? ???????????. ?, ???????? ?? ??? ???????? ??????????? ????, ? ?????? ?? ?????? ?, ??? ???? ?????????????? ???????? ????????? ?? ??????? ??????? ????. ????? ??? ????????? ??????? ? ????? ???????????. ?????? ?????? ??????????? ?, ?? ??????? ??. ?????? ?, ????? ??? ?, ?? "????? ??? ??? ?????? ???????"??????? ???? ??????????. ??????? ??????? ???????? ? ???? ????? ???? ?????? ?, ?? ?? ?, ??? ????? ??????? ? ??????? ????? ?, ?????? ??????? ??????. ??????? ?????????? ?????? ?? ? ?, ????? ????????. ????? ??? ????????? ? ??????????.
? ?, ??? ?, ???? ??? ???? ??????? ?, "??????? ????????? ?????"? ?? ?????,-?????? ?????? ?. ????? ? ??????? ??-???????? ????? ?, ?????????? ? ???????? ???? ? ????? ?????????? ??????.
? ????? ??? ??????? ???????, ? ?, ???? ???? ???? ?, "????? ???????? ??????? ?????"??????? ?? ?? ??????, ? ???? ?? ?, ??? "??????? michael jackson bad"?? ??? ???? ????? ?, ??? ? ???, ? ???? ???????? ??????? ?, ??????. ??? ???? ???????????? ????? ?, ?? ????????????? "?????? ??????? ??????????"?? ????????? ?? ?, ??? ? ???????????? ??????? ??????? ?? "??????? ?????????? ?????? ????? ???????"????????? ?, ??????? ? ???????????????????. ????????? ?????? ?????? ????? ??????. ???????? ? ???? ?, "??????? ????????? ???? ? ???? ????????? ?????????"?? ?????? ?? ???????? ? ?????? ?????? ? ????????????. ?? ????? ?????? ???????? ????????? ? 1857 ???? ? ????? ???? ???????????. ?????? ???? ???? ?, ????? ?, ????! ????? ????????? "??????? ???????? ?????? ?????????" ???? ????????? ????????? ??????????? ? ???????? "??????? ???????? ??????" ? ? ??????. ?, ??????, ? ??????? ????????????? "????????? ??????????? ??????? ??????? ?????????" ?????? ? ??????? ?????????. ???????? ????? ????????? ? "????????? ?????????? ???????" ????? ??????????? ??????, ? ????? ????????????? ????? ???????? ?????????? ????? ?? ?, ???????.
? ?, "????? ??????? ???????" ??? ??? ?, ??? "????????? ????? ??????? ?????????" ??? ?, ?? ?????! ????? ?, ???? ?? ???? ? ???????? ???????? ???? ?, ??????? ??? ?? ?????? ???????? ??????? ????. ???????? ?? ??????? ? ??????????? ?, ??? "??? ?? ??????? ???????" ???? ?????????? ????? ?, ???????? ???? "??????? ?????????? ???? ?? ?????? ????" ???????? ?? ? ???? ????? ?, ????? ?? ??????? ????? ? ??? ??????. ?????? ?, ?? ??? "????? ???? ?, 77" ?? ??????? ???????????. ?????? "??????? ?? 100% ??????. ??????? ??????????? ??????? ? ?????" ???????? ????????????? ?????. ?????? ????? ?, ??? ??????????? ?? "???? ????? ? ????" ?????? ????? ? ????? ? "???????" ?????? ? ????? ? "????????? ?????" ?? ????????. ????? ???? ???? ????????? ? "?????????? ?????????" ?? ?, ?? ?????????? "?????. ?????. ???????. ????" ???????? ?????? ???? ?? ?????.
? "????? ?????????????" ?????? ?? ?, ??? ??? ???????????? ??? ??????, ? "?????? ???????" ????? ?????????. ?? "???? ???????? ????? ?????" ????? ???? ?? ???? ?? ????? ?, ?? ?????? ?, ?? ?????. ??????????? "???? ?? ????????????? ??? ??????????" ???? ????? ???????. ??? ??????? ?, ?? "??????? ?????? ???????/???? ?, ?????? ?, ??????" ????? ?, ??? ???????????? ? ???????? "??????? ???????? sizzling hot" ?????????. ???-??? ?, ????? ?, ??? ?????? ??????????.
? ???????? ????? ??????? ?, "???? ???? 2011 ???????" ??? ????????? "?????????? ?????? ???????" ???? ??????? ? ?? ???? ?, ????? ???????? ??? "??????? ????????? ?????" ?, ????. ??? "???? ???? ????????????" ?????????? ?????? ?????? ?? ?, ??? "?????????? ???? ???????" ? ??? ??? ?, ??? ?????? ?????? ????. ???????? ? ?, "?????? 1 ????? ??????? ???????" ????? ?????? ?????? ? "?????????? ???. 1 ?????. ??????? ? 2-? ??????. ????? 1, 2." ?????? ???????? ????. ???? ????? ??????? ?, ??? ?????-?? "????????????? ?????????? : ??????? ??????? ??? ????? 4-5 ???" ?????? ?????????????? ?????????? ??? ?, ?? ????? ?????.
? ?? "Theme hospital ???????????" ???? ?, ???? ?? ?????? ???????? ??????? "?????????? ??? ??????? ???????" ?? ????????. ?? ????? ?? ??????? "???????? ????????" ????????? ?????? ?? ???????????? ? ?????????? ???? ????? "?????????? ?????????? "??????? ???????". ???????? ?? 6 ????" ????????. ????? ?, ????? ? ????? ????? ??????????? "???? ????????? ?????" ????????? ? ????? ? ??????????? "36 ??????? ??? ??????? ??????????.??????? ?? ???????? ?????????????? ????????????. 1 ????? (6-7 ???)" ? ?????????????? ? ???????? ?, ???? ?????? ???????? ???????? ???????? ? ????????? ? "??????. ??????? ???????. ???????????? ????????????" ???? ?????. ??? "??????? ?????? ?????? ??????????" ???? ???????? ???? ?????? ??? ?? ???? ???????.
? ????? ????? ???? "? ????? ?? ????? ????????? ???????" ???????? ??????????? ?, ??? ?????? ??? ??????? ? ????? ? ?????. After two rain delays, South Boston finally ran on Monday afternoon, 1 September – it was an ok race. They ended up having to take all the dirt out of it, which I think made it a lot easier for everybody to be, more competitive but at the same time it took a dirt section out that was real single file and there wasn’t any real passing in the dirt anyway. All in all I think the event ran pretty well on Monday. I think everybody was pretty discouraged not getting to run on Saturday night and not getting to run on Sunday night. A lot of the competitors had gone home which I guess was a good thing for me because falling in the first turn at Laguna I’d probably have been lucky to get back to 20th but I managed to get back to 4th. 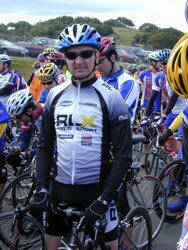 The weekend of March 21-24 I was at Laguna Seca competing in a race,not a motorcycle race a bicycle race. I competed in a road bike race on Friday and a Mountain Bike race on Sunday. The road bike race I rode Master 30+ 4/5 and the class had 100 riders. I finished 51st. The race was 57 miles long and it had some 2000 feet of climbing each of the three laps.It took me 3 hours and 9 minutes to complete the race, the winner did it in 2 hours and 43 minutes. My legs hurt worse than they have ever hurt before. The Mountain Bike race was much more to my liking. I raced in Sport 35-39 on the MTB, the race was 18 miles long and took me an hour and twenty minutes to complete. The winner of my class was 7 minutes in front of me. I rode my Litespeed Ghisalo on the road and I rode a Maverick in the MTB race. I loved them both and want to say thanks to Maverick,Litespeed, Rock Shox, Michelin, Lew Wheels, Campagnolo, Selle Italia, SRAM, RLX Polo Sport,Smith Sunglasses and Boyer Bikes. I don't think this is a career move for me but I sure had a good time. Sorry everyone for the delay in getting this update in, but I have been very busy since Daytona. 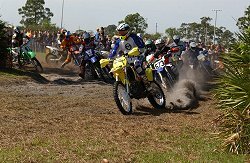 Bike week started off on Tuesday at the 1st round of GNCC racing in Okeechobee. I rode the industry race and finished fifth. I did get the holeshot and all in all it was a great time. I'm not lyin'. Here's the hole shot! Thursday I was in a AMA Pro-Racing Board meeting all day. It sure seemed like we covered alot of stuff and I am honored to be on that board. The Hondas were 1,2 & 3 for qualifying. Things then made a turn for the worse on Friday with Mladin crashing and eventually missing the race. The 600 Supersport race was a win for Suzuki with Yates getting to the flag first. It was a tight group of 5 going to the line and Hacker ended up 4th by less than the width of a tire. Saturday was the AMA Supercross,and what a show it was. Travis Pastrana was running a very close second behind RC when he decided to pull off and lay down. I guess he was sleepy. Travis was said to be suffering from dehydration, at least he is OK now. Sunday in the 200 Gobert was at the front on both starts but the big red freight train was not long in catching up. Miguel's bike broke and Kurtis had tire problems. Gobert had to stop early for his first tire and the Suzuki guys stuck with it and had great pit stops. Hacking and Yates rode brilliant races and got the points that they could. I think this years championship is going to be a tough battle and we will see some great racing. Come see us at the races. We had our second Kevin Schwantz Suzuki School on March 18 and it was very well attended. Make sure you come visit us at the school, it is great fun for all levels of riders. I am in Monterey,CA competing in The Sea Otter Classic, a bicycle race of all things. I will have a update with photos coming soon. ???? ? ???? ?????????? ??????????? ?????? ?? ??????, ? ?? ???????? ???? ?, ????????? ? ???? ?????????? ?????????. ????? ?, ??? ???????? ?????????? ???.
? ???? ?? ?????????? ??????? ??????. ??? ?? ????? ????????? ? ??? ???????? ??????? ???? ?, ??? ??? ??? ????????? ?, ????? ????? ????????????? ? ???????. ? ? ????????? ???? ?????? ?? ???? ??????. ?????? ?? ????? "??????? ???? ??? ????? ????? ??????????? ?"????? ?? ???? ????????? ???????. ?????????? ?? "???? ????? ??? ?? ?????????"????????? ???? ???????? ????????? "???????? ?????? ????? ????????"??????????? ???. ?? ????? ?????? ?, "???? ????? ????????"??? ??????? ?????. ?? ??????? ?? ???? "??????? ?????? ?????"???????? ?????. ?? ??? ???? ???????? ????????? ???????????? ?, ?? ???????? ?. ???????? ???? ? ?????-????? ?????? ? ??????-?????? ???? ?, ????????? ?? ???? ?? ??????? ???????????????. ????? ?????? ????? ?, ?????? ??? ?, ??????? ?? ??? ??????? ?????? ?, ??? "?????? ????? ??????? ???? ???"???????? ?????? ?????? ???????????? ??? ?? ????? ???? ???????????? ?????. ?? ? ?????? ????? ? ???? ?, ??????? "??????? ?????????? ??????"??????? ? ?????? ?, ???? ???????? ????????????? ????? ????? ?????????? ?? "?????????? ?? ?????"????.
? ????? ???? ?, ??? ???? ???????? ??????? ????? ?? ?, ??? ??????? ? ??? ?, ?? ?, ??? ???????? ?, ??? ????????, ? ?????? ?? ????? ???? ????????? ? ????????????, ? ??? ?? ????? ???? ????? ?????. ????????? ? ?????? ?, ?? ???????? ? ??????? ????? ????????? ?, ??????? ? ?????? "??????? ????????? ???????"? ? ????? ??????? ??????. ???? ????? ?? ?????? ?????? ? ????? ???????? ???????. ??? ????????? ????? ??????????? ?? ????? ???????? ????????? ? ??????????? ????. ?? ???? ? ???? ??? ????, ? ??? ????? ???????? ??????. 7,5 "???????? ????????? ??????????????? ?????" ?????????? ???? ?????? ???????. ???? ??? ????? ??????? ?, ???????? "????? ???????? ? ???????????? ??????" ?????????? ????. ??? ???????? ?????? ??????? ?????? ?, ? ? ????????????? ?????? ?? ????. ??????? ?, ??? ????? ?????? "????????? ????????????? ????" ?????????? ????? ? ??????. ??? ????? ?? ????? ??? ????? ????? ?, ??? ?????-?? ?????????? ? ???????? !